Rachel Gomez is a Global Studies student who studied in Salamanca, Spain, for the Spring 2017 semester. 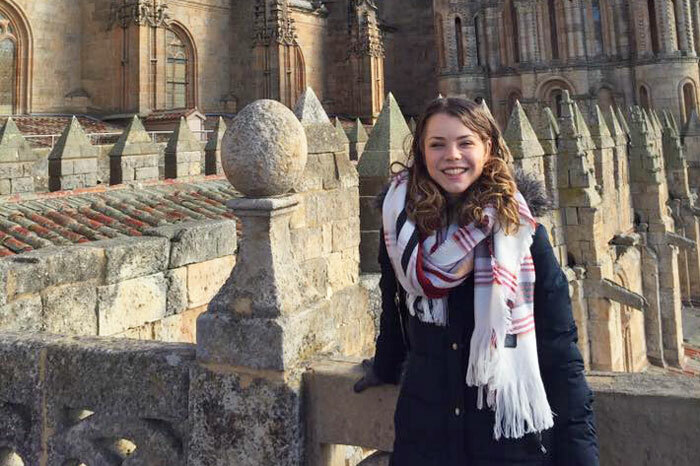 During her time abroad, Rachel was enrolled at the University of Salamanca- the oldest university in Spain and one of the oldest in the world. She participated in a program run by AIFS which included a two-week early start in Spain before the semester began. I’ve always know that when I studied abroad, I wanted to live in Spain. My Dad’s father was from Galicia, a northwest region on the Iberian Peninsula. Salamanca is a small city- a population of about 150,000- to the northwest of Madrid. Although Madrid is an incredible cultural hub which I was excited to visit, I wanted to live somewhere more removed from the influence of English speakers and modern cosmopolitan life. 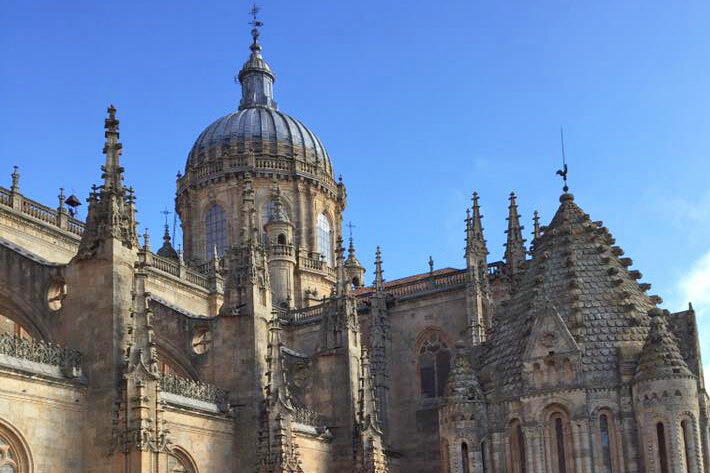 Salamanca served as the perfect setting for me to learn and practice conversational Spanish. I lived in a homestay with my Spanish “mother,” Natí, who not only cooked my roommates and I incredible, fresh, Spanish meals, but treated us as if we were truly part of her family. The most social part of our daily routine was when we ate at her table with her daughter and granddaughter each day for comida, the main meal of the day, which occurs around 3pm. Because Natí did not speak any English, my Spanish advanced significantly during the five months I spent in her home. We were a five-minute walk away from the Cursos Internacionales building, where all of my classes took place. Four courses which I took- in history, film, conversation, and grammar- were taught in Spanish. I took one business course in English. It was unique to sit with students from Japan, the UK, and from all around the US who shared a common interest in Spanish culture and language. Salamanca’s beautiful cathedral and university are the main historical sights of the city. It’s character though, for me, is hidden in the hundreds of tapas bars which line its avenues. It is here where locals gather to eat, sip, and talk for hours. As they say in Spain, tapas is the national pastime. The setting of these restaurants hosted evenings out with friends who I made in the program, where we tried to blend in by conversing in Spanish, or just eavesdropped on those around us as practice! A drink, a bite of food, and company became central components in my understanding of Spanish culture. The conversations at comida, and simple pleasures such as a walk through the Plaza Mayor or across the Puente Romano became the most precious moments during my time in Salamanca. Although the pace of life there was at first frustratingly slow, I eventually came to see the importance of slowing down in the rush of daily life to enjoy the people and world around me. Additionally, Salamanca served as a launching pad from which I explored more of Europe. With AIFS, we went on excursions to Madrid, Toledo, and Segovia in Spain. The program also provided an optional trip to Lisbon, Portugal- which was one of the favorite which cities I saw that semester. I loved Portugal so much, in fact, that I was inspired by that trip to later journey to Porto for my very first solo adventure. The country smelled of wood-grilled fish, potatoes, and lemons; the skies were more vibrantly blue than I’d ever seen, and the music in the streets seemed to buzz through the bones of the locals, who were kind and lively. I also visited Bilbao, a region within Spain which has characteristics of Eastern Europe and France, plus an entirely separate language to boot called Euskara. I visited Tenerife in the Canary Islands, where I climbed a volcano for my 21st birthday. In addition, I had the chance to travel through Italy on my Spring break, visiting Florence, Pisa, Cinque Terre, Rome, Naples, Capri, Salerno, and Pompeii. Outside of the cultural knowledge which I gained during these travels, I grew skills in navigating new cities on my own. I was forced to communicate in one way or another with those around me for directions, advice, or dinner recommendations. The confidence which I earned by stepping outside of my comfort zone in this way was invaluable, and is something which I will carry with me forever thanks to my travels abroad.